Two years into his papacy, Pope Francis has become hugely popular mainly through his dedication to causes like social justice, eliminating poverty and climate change. His reputation as the people's Pope was evident on Friday (Sept 25) as more than 80,000 thronged to New York's Central Park to catch a glimpse of him. Just like fans of any rock star, the attendees at Central Park, who won free tickets through a city lottery, started lining up early, about 1am the night before. The attendees, not all of whom were Catholic, came with American flags, hand-drawn posters and held their phones aloft trying to get a decent photo. While waiting for the Pope, the crowd would burst into various songs - some of which were in Spanish. In an exhaustingly packed schedule in America, he gave speeches in front of a divided congress - and touched on key issues like immigration, and economic quality. He also spoke in front of the UN General Assembly about his vision of a better world. There, he touched on the persecution of Christians, the Iran nuclear deal, drug trafficking, a passionate plea to protect the environment, and the rights of girls to an education. Then this guy (a US Congressman) pretty much stole the glass of water that the Pope had drunk from and took a sip from it, before sharing the rest of the water with his wife and members of his staff. On Friday, the Pope also led a multi-faith prayer at the National September 11 Memorial and Museum 9/11 memorial service on Friday. When he moved on to Philadelphia over the weekend, he further underscored his celebrity status by going off-script, turning in jokes while delivering key messages on the importance of family. The issues that the Pope has championed during his leadership have struck a chord with many people - both Catholic and non-Catholic - on social media. 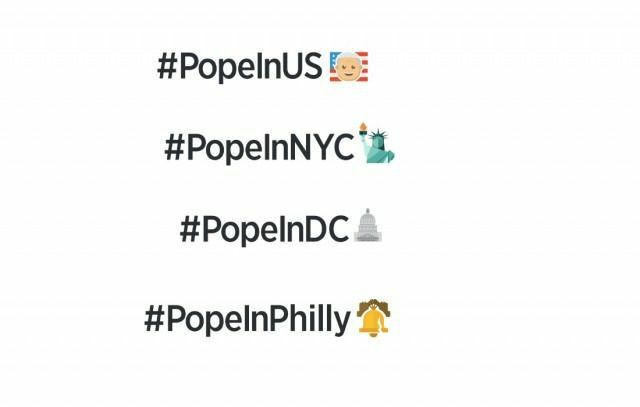 And Twitter has rolled out a special set of emojis to mark Pope Francis' historic visit. Earlier this week it introduced special characters that include an image of Pope Francis in front of an American flag, the Capitol building, the Statue of Liberty and the Liberty Bell. And... a real rock star? Pope Francis is about to literally become a rock star as he is set to release an album this november. The multilingual album features prayers and speeches from the Argentine-born Pope, which will be accompanied by newly composed music. There is already a teaser of the album with the release of the first single Wake Up! Go! Go Forward!. It features synths and strong rock guitar riffs - as well as trumpets. The producer and artistic director of the album Don Giulio Neroni told the Rolling Stone: "I tried to be strongly faithful to the pastoral and personality of Pope Francis: the pope of dialogue, oepn doors, hospitality." While an album released by a pope is not new, the rock approach is considered to be non-traditional.